UPDATE: Maryland medical marijuana sales are launching in December 2017. First, you must register as a patient with the Maryland Medical Cannabis Commission. For children to receive medical cannabis, at least one parent or guardian must register as a caregiver. Then you need a certification from a doctor who is already registered with the commission. An expansion of the law also allows nurse practitioners, dentists, podiatrists and midwives to certify patients to use medical cannabis. Dispensaries will check an online database of certifications before selling marijuana to patients. The registry is available on the cannabis commission’s website. How do I find a doctor who will recommend marijuana? The medical marijuana law is written with the idea that patients may use cannabis if it is recommended by their health-care providers. In practice, people probably will seek out providers who are willing to certify patients, and some health-care professionals will advertise their willingness. Regulators are trying to avoid a system in which unscrupulous health professionals hand out certifications to anyone who pays. Maryland’s rules require a provider to have a “bona fide” relationship with a patient and to meet the patient in person before issuing a certification for medical marijuana. The list of participating providers is not public. Can patients from other states purchase marijuana? The law allows nonresidents to participate if they are being treated in Maryland (such as cancer patients receiving chemotherapy). But the commission is not currently registering out-of-state patients while it reviews its policies. It is a federal offense to transport marijuana across state lines – even to the District of Columbia, Delaware and Pennsylvania, where the use of medical marijuana also is legal. What conditions qualify for treatment with cannabis? Cachexia or wasting syndrome, anorexia, severe pain, severe nausea, seizures, severe or persistent muscle spasms, glaucoma, post-traumatic stress disorder and chronic pain are all treatable with medical marijuana, the law says. But the regulations have a catchall provision that allow physicians and other providers to recommend cannabis for patients if they think doing so is in the patients’ best medical interests. Does medical marijuana need to be smoked? 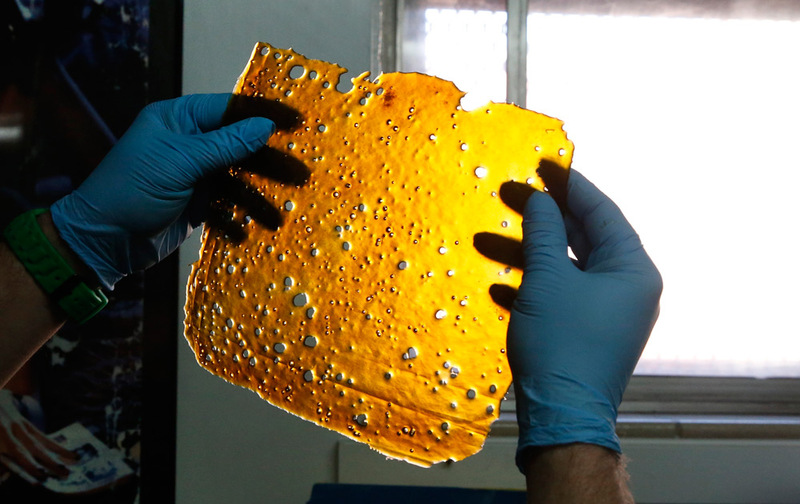 In addition to the dried-leaf variety, companies have plans to process medical cannabis into a variety of other products including capsules, oils, creams, vaporizing pens and a peanut brittle-like substance called shatter, which is a concentrated form of cannabis. State law does not allow edible medical marijuana products – such as brownies, cookies and gummies – which are popular in other states.